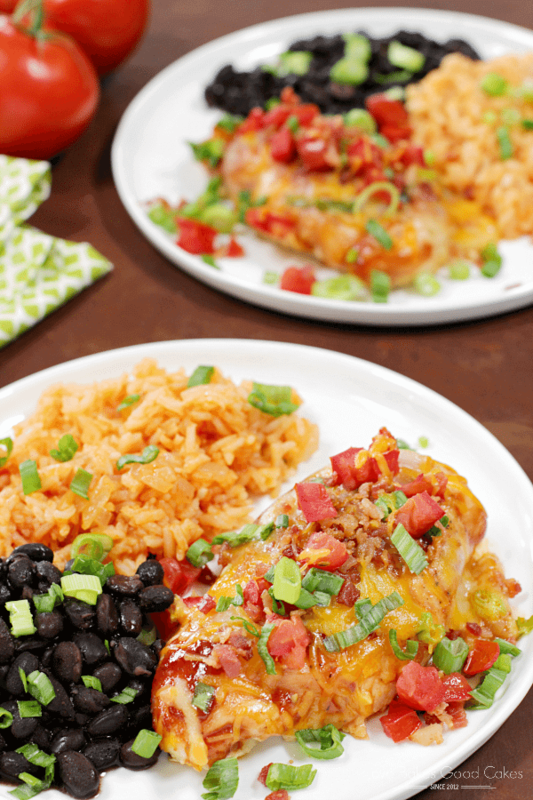 Baked Monterey Chicken – baked chicken slathered with BBQ sauce and topped with two kinds of cheese, bacon, tomatoes, and green onions. Make dinner delicious tonight! We eat a lot of chicken in the Love Bakes Good Cakes house … a lot. of. chicken. So much so, that my mom has a running joke with me when we talk about what’s for dinner – she almost always guesses that we’re having some sort of chicken dish …. and 9 times out of 10, she’s right. Growing up, my Dad would be deployed for his job the US Navy – usually, for 6 months (or more) at a time. Back when I was a kid, I imagined he was on some sort of Carnival Cruise Lines type of “cruise” when he’d leave. I bet he wishes it was like that!! 😜 When would come home, he would joke (maybe not joke?) that the mess cooks had 365 ways to cook chicken … and I think I might have them beat with the number of ways to make chicken! Oh, yes! 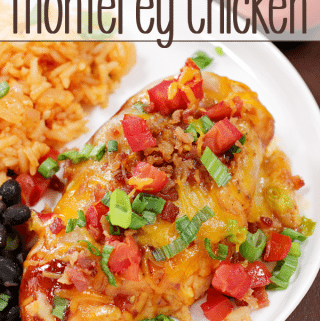 We have lots of chicken recipes that we love in the LBGC house, including this Baked Monterey Chicken. 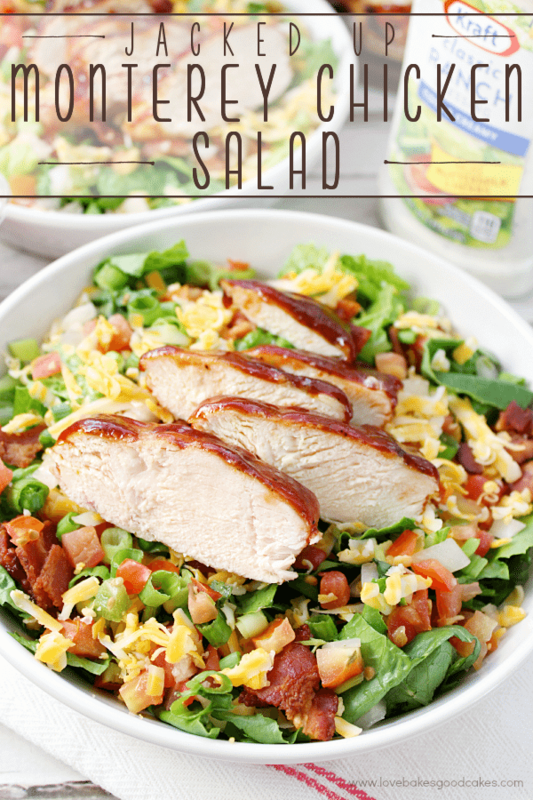 It’s quick, easy, and delicious! 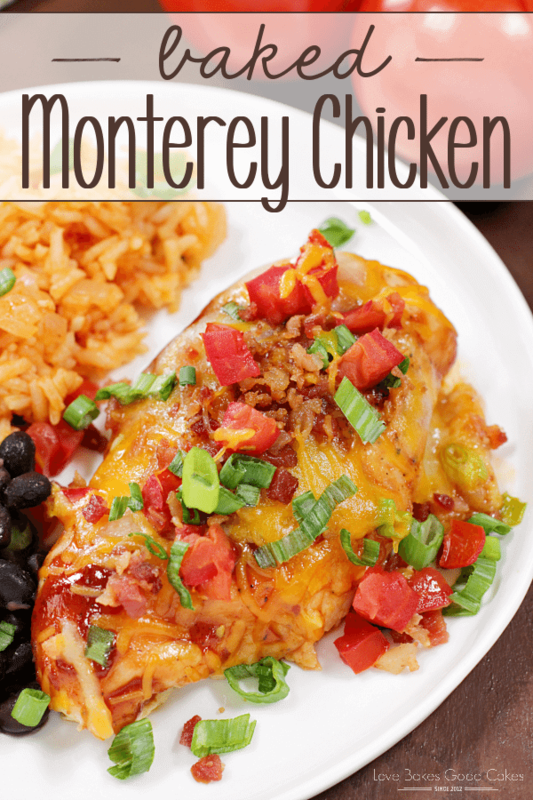 Plus, it uses some of our favorite ingredients (chicken, bacon, BBQ sauce, and cheese) in one chicken dish! I love to serve this with a side of Mexican rice and seasoned black beans. It’s a meal the entire family loves! I hope you’ll give it a try! 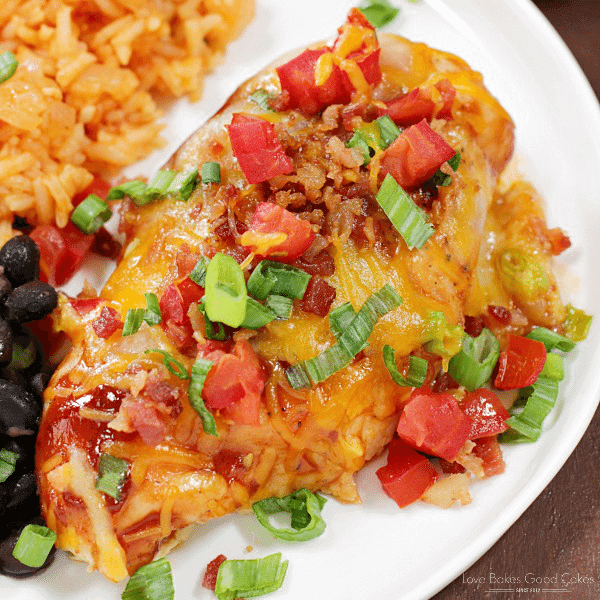 Baked chicken slathered with BBQ sauce and topped with two kinds of cheese, bacon, tomatoes, and green onions. Make dinner delicious tonight! 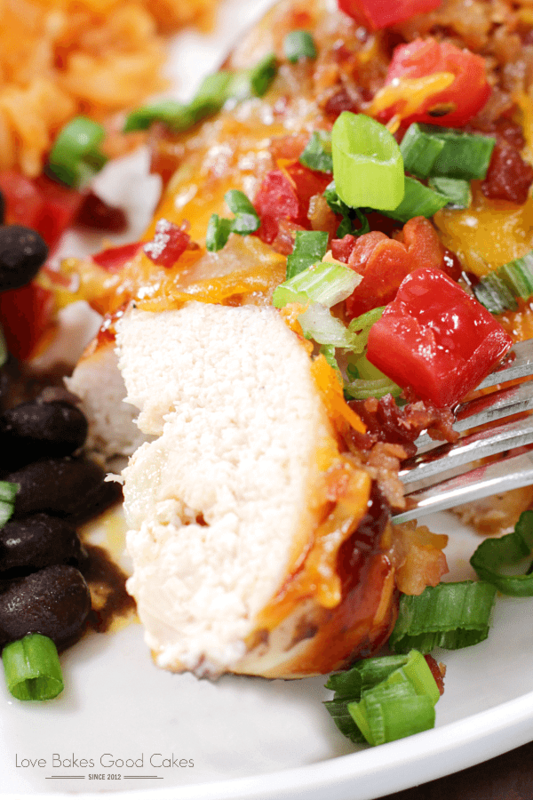 Place chicken breasts in a single layer in a large baking dish. Brush both sides of each chicken breast evenly with olive oil. Season with salt and pepper. Remove the chicken from the oven and brush the tops and sides of each chicken breast evenly with BBQ Sauce. Return the chicken to the oven for 5 minutes. Remove the chicken from the oven and sprinkle both kinds of cheese evenly over the top of the chicken breasts. Evenly sprinkle the bacon over the top. Return the chicken to the oven for 3-5 minutes or until the cheese is melted and the chicken is no longer pink. 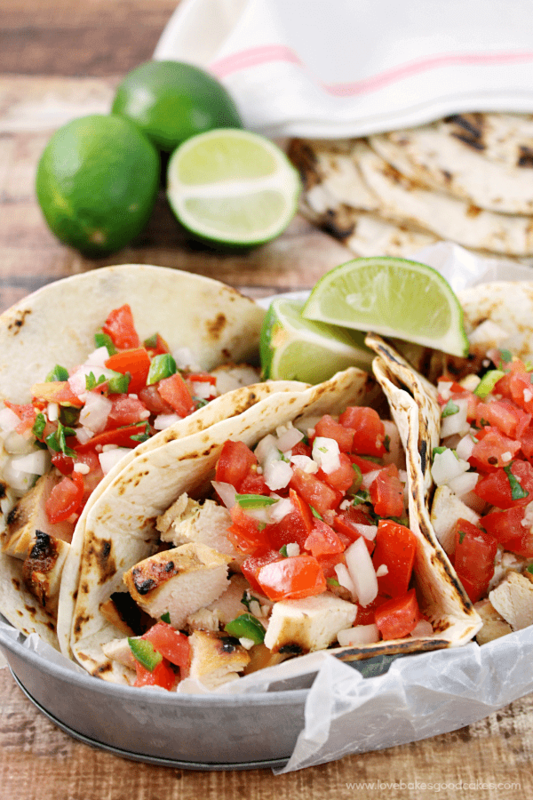 Remove the chicken from the oven and evenly top with tomatoes and green onions. Loosely cover the baking dish with aluminum foil and let the chicken rest for 5 minutes before serving. You can never have too many ways to make chicken. This one looks delicious. The whole dinner looks like something I'd happily enjoy!